By now you may all have heard about this juicing trend that has really caught on with the masses, especially those who are health conscious and want to live a clean and healthy lifestyle. The concept of juicing has been around for ages so that is nothing new. If not yourself, you probably know a handful of people who owns their very own juicer at home; a fun do-it-yourself kitchen appliance where you throw in your fruits and vegetables into the machine and within minutes out comes a cup of freshly squeezed juice. Over the past few years, the concept of “cold pressed” juices has spread like wild fire. Traditionally, juices that are not considered cold pressed (basically the old school way of juicing) utilizes a fast spinning blade within the machine to separate the juice from flesh through what is called centrifugal force (a motion tending to move away from the centre). The problem with utilizing this fast spinning blade is as it spins, it generates heat. This heat destroys some of the enzymes in the fruits and vegetables you are juicing causing some of the nutrients to be destroyed as well. So what does “cold pressed” actually mean? Well as the name suggests, the juicing process does not generate any heat to maximize on all the nutrients it can extract from the fruits and vegetables. It extracts juice by using hydraulic pressure crushing, squeezing, and pressing the fruit and vegetables for the highest nutritional yield having very little exposure to oxygen. Since the fruits and vegetables are literally being crushed the living day lights out of them using sheer force, heat does not get generated and more of the fresh ingredient’s nutrients stay in tact. 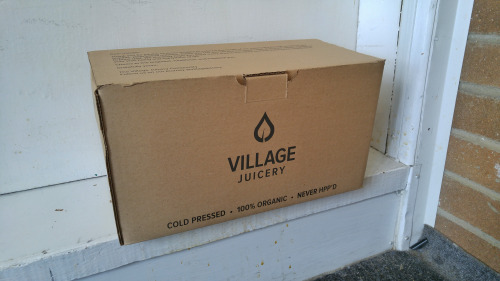 One of the companies in Toronto on the forefront of this cold pressed movement is Village Juicery who call their juicing community their “Villagers”. Village Juicery believes in increasing access to raw, plant-based nutrition and a focus on keeping everything local, from their produce suppliers, industry suppliers, and the charitable organizations they support. In fact, it is almost hard not to notice just how local their business is. On every one of their bottles, a sticker is firmly placed on its cap that says “Made in Toronto.” As a loyal admirer of my city I grew up in my entire life, I can truly appreciate how much love and devotion Village Juicery has on this great city. Now onto the good stuff, the actual juices! The Village Juicery delivered to my very own door step their line of 100% organic cold pressed juices. 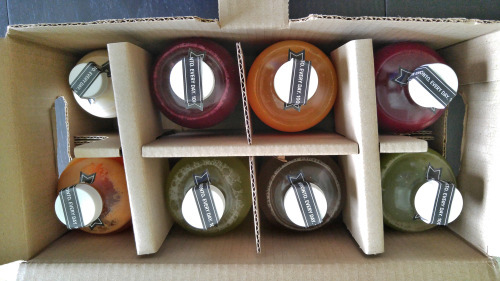 I received 7 of their cold pressed juices and 1 of their handmade nut milks in my package. Once you open the cardboard box, you will see that each glass bottle is neatly compartmentalized by dividers to ensure that the glass does not shatter as it gets delivered to your door. The one thing I love when I received all the juices is on each of its bottles, it prints out on the front all the ingredients so you know at a quick glance exactly what you will be consuming. On the back of each bottle also comes with a fun description of that specific cold pressed juice which gives you a better understanding of the different nutrients and benefits it has. At the very bottom on the back of the bottle also shares with you a breakdown of “What’s Inside” as each cold pressed juice has 3 types of ingredients, fruit, root, and green. The percentage by weight of each ingredient is shown so some of the cold pressed juices will be more fruit centric, where others will have a higher percentage of vegetables mixed in. Here is a breakdown of all the Cold Pressed Juices I tried. Although the ingredients in this one is 80% root, there is no ginger in this one which is fine by me. The vivid orange colour to this juice comes from the carrot and sweet potato. Carrot was the strongest flavour throughout with a settle hint of apple in it. I liked it but didn’t love it. Being that I have rarely juiced before, especially with using vegetables, I was a little bit hesitant to try this just because I was afraid that with the majority of the drink being composed of leaf type ingredients it may be too overpowering to drink. I was completely wrong and it became one of my favourites. The pineapple counteracted the taste of just pure vegetables perfectly. The combination of pineapple, fennel, and mint really created a soothing effect within my body as I drank it. The perfect balance between fruits and vegetables giving you an even nourishment on both sides. This is a gentle introduction to anyone who is not a fan of green juices as the two types of apples prevalent in this juice gives it a sweet and fruity flavour, while you are still consuming equal amounts of vegetables with every sip. I would definitely recommend this one. The most unique tasting juice of the bunch for me. The red cabbage is definitely the star of the show in this juice with its dominant flavour profile. You would think that the taste of cabbage may be unpleasant, but it wasn’t hard to drink at all. The familiarity of apple juice is present as well which makes this juice just as easy to stomach as the others. My favourite cold pressed juice of them all which surprised me since the majority of the ingredients in this one is vegetables with very little fruit. The vegetables chosen in this juice is not overpowering as the likes of celery, kale, and lettuce all have a very subtle taste to begin with. The splash of apple mixed in made this juice very pleasant to drink and the fact that I enjoyed a juice dominated by vegetables makes this one a home run for me. The classic apple juice, cold pressed edition. Nothing hard at all about drinking this one if you’re a fan of just good ole’ apple juice. With the apples being cold pressed, you get even more nutrients in this one, not to mention its also unfiltered with no added sugars. The Handmade Nut Milk which I treated it like a dessert. What a perfect name to this drink. It truly was a joy to drink because it tasted so damn good. It’s a sweet, creamy, decadent drink with the primary flavour of this being cashews and a hint of maple syrup. The only thing bad about this drink was that the bottle was so small! If I could drink this everyday for the rest of my life I totally would. Many other cold pressed juice companies use a technique called HPP (High Pressure Processing) which is a cold pasteurization technique where products are subjected to a high level of isostatic pressure. This pressure will extend the shelf life by 10 times, but in doing so killing bad and good bacteria along the way. As seen on every bottle, Village Juicery firmly believes this is not a viable solution for our well-being as bacteria plays a critical role in digestion and are needed to support proper nutrition. That is why they will never use HPP and their cold pressed juices are best consumed within 3 to 5 days of pressing to ensure maximum nutrition. Also keep in mind that if you keep the glass bottles after you finish the juice, you can return the rinsed bottle to a Village Juicery store for a discount at your next purchase! Myself, I’m keeping several of them at home for future use. My only qualm with it was that the fonts used on the bottles are all stickers so with a little water on it, sometimes the stickers would start to peel off leaving a slightly sticky residue on the bottle. All in all I’ve had a wonderful experience with the cold pressed juices from Village Juicery. As a food blogger, often times I am eating tons of fatty, greasy foods for the sake of a picture so being given the opportunity to cleanse my body and re-fuel it with organic, nutritious ingredients was certainly welcomed with open arms. If you think you are ready to go outside of your comfort zone and try some of these cold pressed juices, you can visit their flagship store in Toronto in the heart of Little Italy (540 College Street). Many other retailers across this city also carries their cold pressed juices which you can find their locations here. Thanks to Village Juicery I’m feeling rejuvenated, healthy, and ready to take on anything that comes my way. I am definitely proud to be considered now as one of their Villagers.